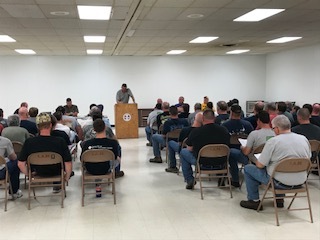 Members of IAM Local 1010 ratify an effects agreement with Siemens Energy, Inc., ahead of the company’s recently-announced plant closing in Burlington, Iowa. Members of IAM Local 1010 have ratified an effects agreement with Siemens Energy, Inc., ahead of the company’s recently-announced plant closing in Burlington, Iowa. The agreement covers how workers will be compensated during and after the shutdown. Siemens officials met with IAM Local 1010 members at the Burlington facility in late April, dropping the bombshell announcement that the company was eliminating a portion of their product and the remaining products would be moved to other facilities in the U.S. and Europe. The news came on the heels of two previous Siemens plant closings announced back in February, affecting IAM Local 1580 members in Wellsville, NY and Local 90 members in Mount Vernon, Ohio. The Burlington plant closure will affect 61 IAM members who make small steam turbines for other manufacturing companies. The facility has been in the community for nearly 150 years. Members of the Bargaining Committee included Stucker, IAM District 6 Directing Business Representative Scott Webster, Chairman Randy Goble, Chris Tucker, Kent Timmerman, Justin Scott and Guy Pratt. IAM International President Bob Martinez recently held a press conference with House Democratic Leader Nancy Pelosi and House Democrats on the topic of plant closings and the broken promises of Trump’s #GOPTaxScam. The IAM maintains the recent plant closings taking place across the country are a direct effect of the Trump tax plan signed into law in late December. Siemens anticipates layoffs beginning August 2018. The plant is scheduled to close by January 2019.